Most of you know by now, the news that Billy Graham has passed away and there is a huge chance that his ministry has impacted you personally in some way. I heard this morning it is estimated he has led over 3 million people to Christ. Three million. 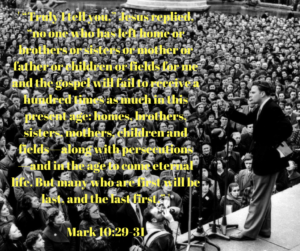 It’s hard for me to even fathom leading that many people to Jesus in my lifetime. 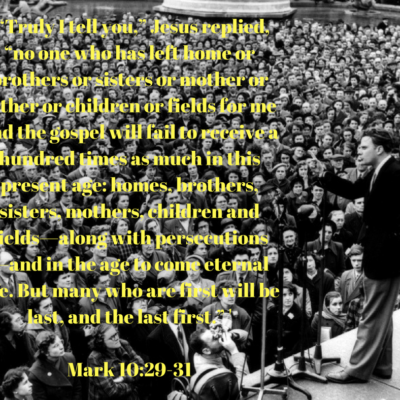 Here’s what I know, Billy Graham gave his life to following Jesus and trying to lead people to having a relationship with him. Here at Williamstown Christian, our vision for ministry is similar, we exist to bring people to Jesus and grow and train all in His service. See, much like Billy we want to see people come to know Jesus for the first time, and to train those that know him in leading other people to Jesus. Jesus words here tell us that if we give up our lives in search of Him, for His service, that we will receive the reward, and not only in this life, but in the gift of eternal life.